Wednesday marked the final practice before Saturday’s spring game and the conclusion of offseason workouts for the Cardinals. It’s bittersweet to be sure, as after the spring game, it’s a long wait until August, fall camp, and the hopeful optimism that the season isn’t that far off. After Saturday, we’re in the dark for roughly 3 months or so, and that’s always not a lot of fun. Thankfully, this offseason is unlike recent ones, where answers outnumber questions, stability takes the place of uncertainty, and a sweeping calmness has replaced turmoil and doubt. Indeed, these recently uncharted waters for BSU football are strange days. Final practice before the Spring Game was a little shorter. What did you do differently? Yes, we shortened it five minutes. I am sure the guys got a good laugh out of that when they looked at the schedule. You can’t argue that is wasn’t shorter though. We need to get our work done out there. We came out in helmets and put an emphasis on fundamentals, special teams and game situations today. The offensive skill players spent some time working on how to react when the quarterback scrambles from the pocket. This is one of those nuances to the game the average fan may not appreciate. Every player that is involved in the route combination has conceptual rules to follow based on which way the quarterback exits the pocket. These rules change slightly when the line of scrimmage is down in the Red Zone. Our defense was able to dedicate practice periods to blitz adjustments against various formations. We cut back on some team periods and did additional work separate from each other. Our PAT/field goal unit was also able to cover some unique game situations that might occur once or twice in a season. Talk a little about your annual Career Night which is Friday? We work very hard to develop our players as students and as well-rounded young men. We want them to maximize their potential academically and to be as prepared as possible for the “real world” after Ball State and after their football career concludes. The life lessons that our football alumni can teach help our players develop a vision for where they can go with their education. One of the things they inevitably learn from our former lettermen is that their college football experience is also a huge part of their education. There is a reason why so many employers look to hire former student-athletes. Last year, our players were amazed to learn just how successful some of our former players are in their careers. You hope they walk out of the event and say, “Wow, I can be like that guy some day if I stay the course.” It is also interesting to see how much the football alumni miss their days as college football players. That tends to help our current players develop a greater appreciation for the opportunity they have here right now. The career night event is a great way to hand pick some successful football alumni and get them reconnected to the program in a meaningful way. What is the plan after Saturday’s Spring Game? Even though spring practice will have concluded, next week is a very busy week for each member of the football program. Our guys will have a series of year end evaluation meetings, similar to what an employee might go through with his supervisor. Each player will meet with his position coach, strength coach David Feeley and with myself. They have some paperwork to fill out including a goal setting sheet and a self evaluation form. I want to know what they think of their own progress as well as what we think as a coaching staff. Goal setting is an important piece of the puzzle. It is important goals are realistic and attainable. This is usually a very good learning experience for the new players in the program. It is also very rewarding to see how some of the older players mature and take more responsibility for their own destiny with each passing year. There are also some additional peripheral activities next week including head shot photos, the athletic department year-end banquet and a final team meeting. Perhaps most importantly, our guys need to finish up the semester strong from an academic standpoint. So the Cardinals take today off and then enjoy a bit of time focusing on life after football before the spring game fiesta on Saturday. Personally, I’m curious to see what sort of crowd will be on hand. 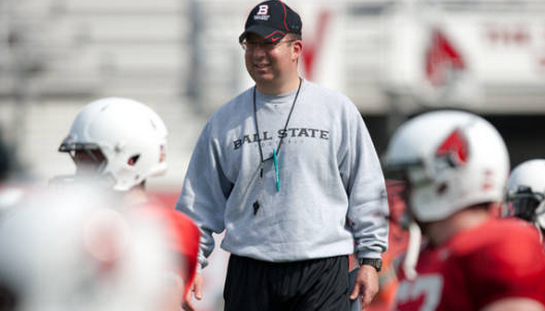 This is Coach Lembo’s second spring game, the team enjoyed a bit of unexpected success last season, and there’s been another several months of pressing the flesh, emailing the community, and attempting to rouse the support in Muncie. Saturday will be a great indicator (in comparison to last year’s crowd) of what we can expect when the season starts for real in August.